The melody queen Shreya Ghoshal has sung over thousand songs in different language. She started her career from 1996 after winning a TV reality show. 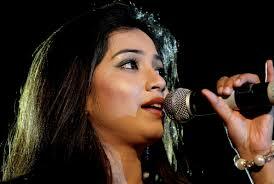 The Bengali bala is ruling the hearts of many people with her marvellous and melodious voice. She has sung different song always from a romantic song to an item song, from a sad song to happy song. Whenever she comes she brings little bit different taste with her song. We are here providing you All Song Lyrics of Shreya Ghoshal. You will find the Song Lyrics with their Hindi and English Translation. The charm of her voice is spread not only in India but all over the world and also she is having more than thousands of fans following. If you are willing to find All Song Lyrics of Shreya Ghoshal so you are on the right place. Here you will find Shreya Ghoshal All Songs Lyrics in Hindi Font with translation.